This little pattern was born of necessity. My love and I have picked up the habit of drinking infused water out of glass mason jars–which I highly recommend! However, we have had a problem now that it’s warmer with the jars “sweating” when we take them out of the fridge for any amount of time. The condensation pools anywhere you happen to set your jar and it drips all down the front of your shirt, which is rather unpleasant. 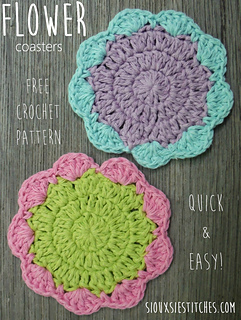 Well, I’m happy to report that these flower coasters completely solve the problem, and they look cute while doing it!